The Sunfish bucked and cavorted at the ramp, looking about as quiet as a rodeo horse and as sturdy as the balsa wood models my brother made as a boy. It occurred to me, not for the first time, that the boat was little more than a dinghy with a sail. Wind blew waves across the ramp. Cold crept in under the personal flotation deice as vestiges of ancient sailing lessons crossed my brain. My first mistake: raising the sail at the launch ramp. The second: imagining I could do this alone. 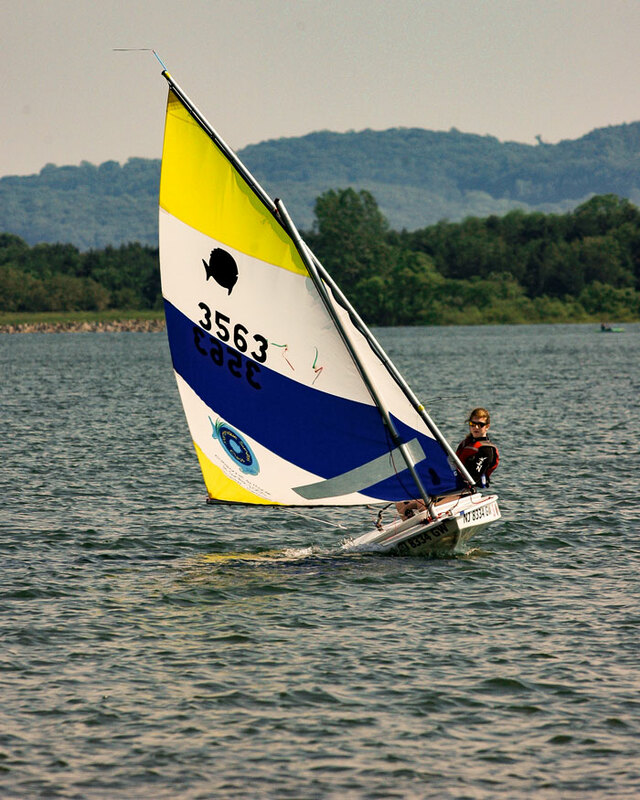 Lucy Bertocci sailing a Sunfish at Spruce Run Reservoir. "Your turn," a friend said. Climbing on board was not unlike climbing onto a moving bar of soap. Its sails flapping, the boat heeled over. I took hold of a line, brought in the sail, and set off. Soon the little boat was sailing, somewhat steadily, along a sheltered section of Round Valley Reservoir. Turning back, I headed into the wind, bumped up to the ramp and swapped places with my friend. "We need a bigger boat," he said, ducking the boom as it swung towards his head. "We need lessons," I answered. One reservoir away, we would address both issues. That evening a web search turned up the Hunterdon Sailing Club.The club's page banner showed a fleet of Sunfish, lined up like butterflies on a puddle on a hot summer day. The Sunfish was obviously popular, but not the club's only boat. HSC hosts other designs, to appeal to sailors of varying degrees of experience. Some of the designs have vaguely ominous names: Jet 14, Force 5, Flying Scot. Several of the boats "plane", causing the front of the boat to rise out of the water. (Planing boats can require quick reactions, or passengers go for a swim.) Other members sail Albacores, a boat described as suitable for husband and wife or parent and child teams; HSC promotes the boat's "unique self-rescuing capability." Friends and family members can also go out together in the Daysailor or the Flying Scot. The club, in fact, offered more choices than expected. My niece, the captain of her college sailing team, offered advice. "Stick with the Sunfish. They don't tip over," she said, and paused. "OK. They don't tip as much." "They're fun. They're really competitive. They're used in college sailing because they're fast. You need to work in the boat, but there is not a lot to think about. Except tactics. If you're racing." "And of course you'll flip a lot in a Laser." "Oh, they'll teach you to right the boats." She rushed to fill the silence on my end of the phone. "Or they'll help you. You'll have a great time." She proceeded to tell a story of a visiting team at a college event, girls who smuggled booze onto their boat. Eventually--no surprise--the inebriated sailors capsized. I wondered about the subtext of her story: If they can manage, so can you. In short order I drove out to the boat launch at Spruce Run. The third largest reservoir in New Jersey, Spruce Run attracts sailors and sportsmen through much of the year. Members of the Hunterdon Sailing Club pulled boats onto trailers. Most wore wetsuits. It was a good day for the suits. Rain speckled the surface of the reservoir. I took shelter in a shed crammed with boats, flotation devices, and supplies. I shook hands with Charlie Engler, past Commodore of HSC, who has been involved with the club since the beginning in 1964, when Spruce Run Reservoir was created. Charlie explained requirements. Membership costs $100 annually. Anyone interested in signing up for lessons must pass a swim test at the Hunterdon County Deer Path YMCA in Flemington ($10). The swim test requires that requires participants to "tread water, put on a life jacket in the water, and swim about 100 yards." Unfortunately the swim test was a moot point. HSC's popular lesson program was almost full. "There are still opportunities to sail," Charlie explained. "You can go out as crew. You don't need to take the swim test to do that. We also need help on the race committee boat. Members must help out on the committee boat once a season." "Is that the committee boat? With the pontoons?" The past Commodore perked up, apparently cheered by an attempt at nautica lingua. He looked almost as eager to press someone into service as the old British press gangs that kidnapped men for Her Majesty's Navy. "Do you want to go out? We're just about done, but I'm sure they could use a hand." I explained I didn't have a wet suit. Or a slicker. Or an umbrella. But that was OK too. The club is as much about a social life as it is about sailing. Soon we were on our way for pizza and beer. More than a dozen people joined us. While we waited for dinner the sailors talked about tactics, designs, races, gear. Charlie played host at the end of the table. On one side a man talked about the joy of road trips, of hauling his rig to different regattas. Occasionally the language of the road merged with the language of the sea, as when he spoke about saving gas on the downwind leg. I wait for the beer to kick in and the stories to begin. Eventually someone recalled a microburst--a short, explosive storm--that tore through the reservoir one Labor Day weekend. Sailors saw a dark wall coming at them, driven by strong winds. Boats flipped over. The diners at the Sunset Inn shrugged off the story. "At first we couldn't find one guy," a man said. "It turned out he'd found shelter on the far shore." Later Charlie shifted the story to HSCs role on the reservoir, emphasizing that the club often performs rescues, usually in the form of tows. "We get kayaks on windy days. Sometimes small craft get blown up against the retaining wall. Spruce Run is friendlier than Round Valley," Charlie explained. "There are more landings. If you're in trouble, you can usually find houses and campers along the shore." On my next visit the fleet had already left, which was also OK. News stations had broadcast tornado warnings the day before and erratic winds still crossed the water. I sat in the shed with members of the club and listened to the music of a marina, the underlying rhythm of the waves on the beach, the staccato ping of lines striking metal poles, the whistling melody of wind playing the rigging of the boats. "I've created a new tool to count GPMs. Gusts per minute." "Guess," Charlie said, pointing to his eyes. The tiny silhouette of the fleet moves along a distant shore. Startled, I point to a boat that seems to carry extra canvas. Charlie, perhaps out of politeness, did not answer. The sail was, in fact, a jib. (For sailors, such a gaffe must be akin to how African guides feel when tourists mistake a young elephant for a rhinoceros.) Soon, however, I suspected he doesn't care. He has seen all types of characters come and go, and no doubt expects to see many more. "Which boat would you recommend?" "That's up to you," he answered. "Come and learn the boats, see which one you like the most." There are ample opportunities to learn. 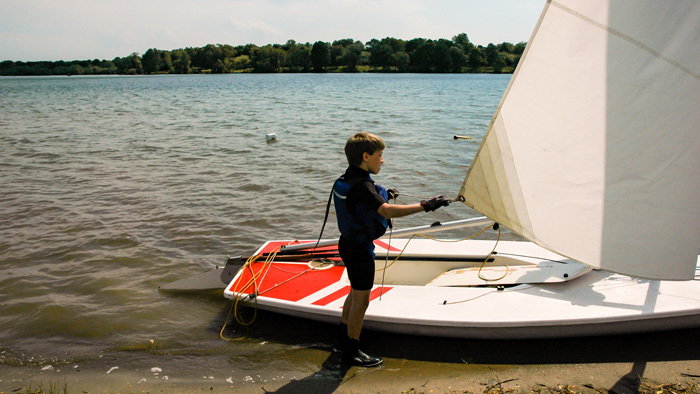 HSC offers extensive training (youth training begins when prospective sailors reach their eleventh birthday). The club also holds five to six different class races on Sunday, with separate starts. On Wednesday evenings the club runs up to five races. 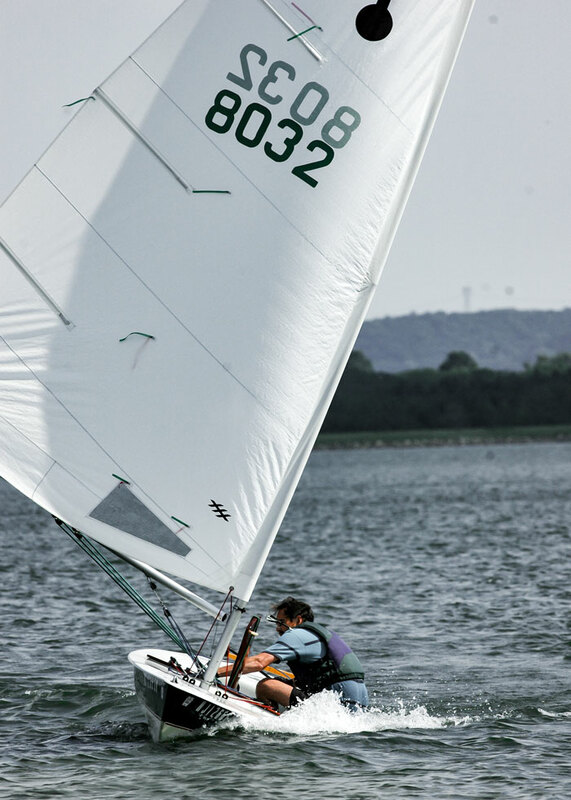 While private boats account for most of the fleet (sixty Sunfish among the members), the club owns ten Sunfish, several Lasers, and Flying Scots. Adults and children sail together. "The youth group is very competitive," Anne Freeman, HSC's head of publicity, said in a phone call that week. "They place in regional and national championships. They have their own program, but they also compete with adults. It's a wonderful opportunity for them to grow and develop confidence." It also gives participants lessons in polite argument. Tactics and rules dominate boat racing. Sailing is a self-governed sport, one in which competitors protest on the water and deal with the dispute later. Knowledge of the rules comes in good stead, especially when the club travels. "It's good fun. Join us," Charlie Engler insisted. "We'll find a boat for you." 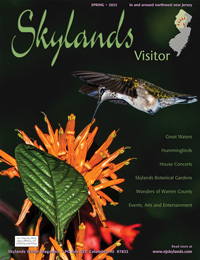 The address for Spruce Run Reservoir is 68 Van Syckel's Road, Clinton, NJ 08809. For more information click or call (908) 638-8572.